your favourite choice of dry fruits. 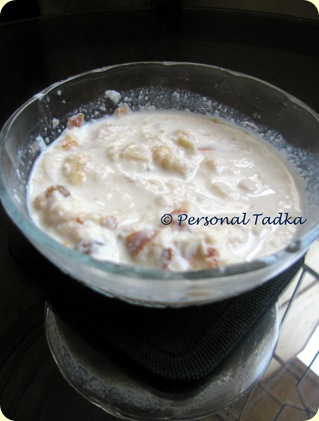 In a bowl mix sugar and custard apple and refrigerate for 1 hour. In a huge vessel pour milk and bring it to a boil, minimise the heat and cook for 30-40 minutes or till creamy. Add milk-maid,sugar,cardamom powder,saffron and dry fruits,turn off the heat. Cool it on room temperature and mix custard apple in it. Chill it and serve in bowls. Hi Priyanka, great recipe. being a gujarati we make this all the time. thanks for sharing happy cooking. thanx pryanka. for the great recipe.